The story of a rescue dog becoming a royal pooch is the subject of this “fiction” children’s book. The book’s illustrations, by EG Keller, are charming, The words are probably fine for a parent reading the story at bedtime. However, for this reader, the beagle’s words, (the beagle narrates the book), could have been a bit less predictable. Whoops, a second “Guy” book is about to be available as well. So now the book has attracted my attention. Can a “true story” (the words on the cover of the book) also be a “work of fiction”? That fancy “work of fiction” statement is surely the work of corporate attorneys. Does the statement save the publisher, (Simon & Schuster) from paying royalties to the royals? Maybe. I wonder how little children receiving a cute book for Christmas would react if they were told the true story may not be true at all? A kiddie melt-down? A life of skepticism? Obesity? When I went on Amazon to see the price of “His Royal Dogness “ ($16.19 hardcover), I was referred to another book–about the same dog! 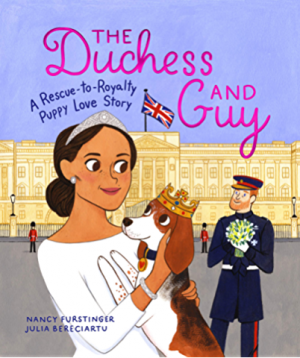 This other book, “The Dutchess and Guy: A Rescue-to-Royalty Puppy Love Story” by Nancy Furstinger and illustrated by Julia Bereciartu will be available on January 15, 2019. I can’t check to see if this book is also legally a work of fiction. However, I think it might be. Guy the dog is surely a great sniffer, but his ability to actually talk with biographers may be lacking; hence the fiction designation. I wonder how many fictional books about this one beagle will ultimately be on the bookshelves. 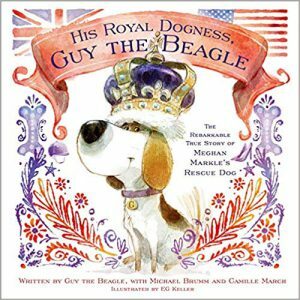 Prince Harry, Meghan Markle and beagles as a dog breed are popular, so we probably haven’t seen the end of ”Guy” books. In fact, I think I’ll write one. My “Guy” will get tired of the royal life. He will leave a note thanking the Queen and her family for the hospitality. He will then run away to Ireland and live with the “normal” MacIntosh family in Dublin. He will eventually find a gorgeous college-educated girlfriend beagle. He will become father to six adorable and smart little Guys. The offspring will ultimately clear up that Brexit mess and solve global warming. You want fiction? Buy my book! A fix for Brexit? AND Global Warming? Sign me up! Thoroughly enjoyed your take on the “royal” beagle books. Yes, you could write much better books about beagles and their owners based on your years of experience with and love of beagles. so, does Megan Markle even have a beagle? Great topic. I agree with Dorothy, you could probably do better! Yes, Meghan has a beagle and it’s name is Guy….but it doesn’t talk to writers!